If your child is having behavioral problems, needs to lose weight or needs discipline in his life, then boot camp may be the right choice. Luckily, there are plenty of options available for you in Michigan. Boot camps provide kids with rigorous training, character development and valuable life skills that will extend far beyond the boot camp experience. There are many available boot camps in Michigan for troubled teens. Sometimes known as "jail boot camps," these camps can be extremely rigorous and should only be used for severe behavioral correction issues. For teens who need a milder form of intervention, there are camps that focus on outdoor activities and are designed to give kids a "wake-up call" regarding their own life choices. This type of boot camp is very short -- only 46 hours -- but is designed to have a serious impact. Adventure boot camps provide behavioral correction through a goal-oriented approach and several activities. Boot campers here various sports -- such as archery and fishing -- and crafts, with an emphasis on relationship building and responsibility. This is a viable option for kids who need to focus their energy and build self-discipline and strong relationships. For kids who display no behavior problems, but need to learn self-care life skills to control weight and get in shape, there are boot camps that accommodate people of all sizes and levels of ability. This type of boot camp provides an eclectic mix of fitness instruction, nutritional counseling and motivational training. Christian-centered boot camps are also available for your teen. Distinguished by a focus on preventative methods rather than correctional methods, Christian-centered boot camps are for all teenagers, not just severely problematic teens. These camps provide rigorous support and spiritual guidance to young people facing social, economic and emotional difficulties. 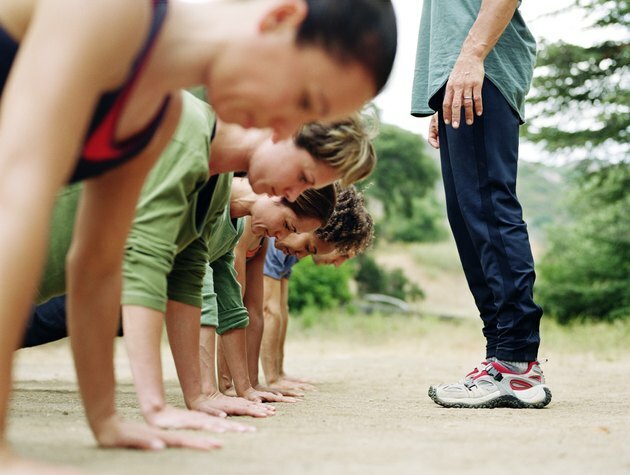 Boot camps can be very stressful experiences for young people. Depending on the intensity of the program, you'll want to stay in contact with the boot camp and make sure the program is building her self-esteem and not tearing it down. Also, it is important to remind your child to drink enough water and sleep and eat properly while at camp, so he doesn't suffer too much from the rigorous activities.